Station 2 can clearly be seen standing majestically atop a small rocky outcrop 100 m west of Station 1. 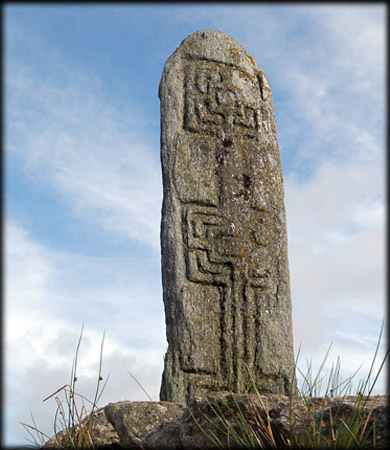 The approximately 1.85 m tall schist pillar stone is beautifully decorated on both sides. The eastern side bares rectilinear patterns while the western side patterns are slightly more freeform. At the base of the pillar stone are the remains of a Leacht, a dry stone altar. 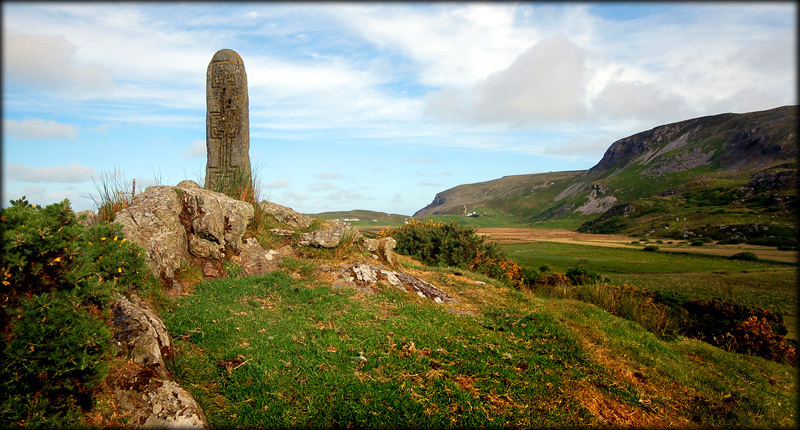 The prominence of this outcrop suggests it may have been a sacred place to pagans; see Farranmacbride court tomb. It was probably Christianised with the addition of this pillar stone. The Glencolumbkille valley is named after St Columba who is said to have built a monastery here. There is evidence of an early circular enclosure in the graveyard at St Columba's Church, this could have been ecclesiastic or even a cashel. Saint Columba, also known as Colum Cille (Old Irish), meaning "Dove of the Church"), was born on 7th December 521 in Gartan, County Donegal and died on the 9th June 597 AD. 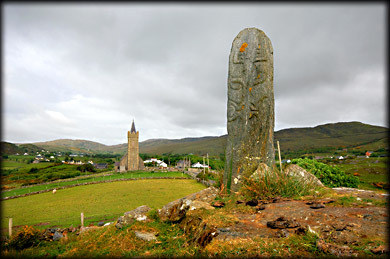 Situated: As you enter Glenncholmcille from any direction you will see the spire of St Columba's Church. If you enter Glencolumbkille from the R263 take the first right and follow the road around to a T-Junction. Turn left here and drive/walk down to the church on your right. Station 2 stands on the rocky outcrop 100 metres passed the church. Discovery Map 10 G 5329 8499. Last visit Jun 2010.